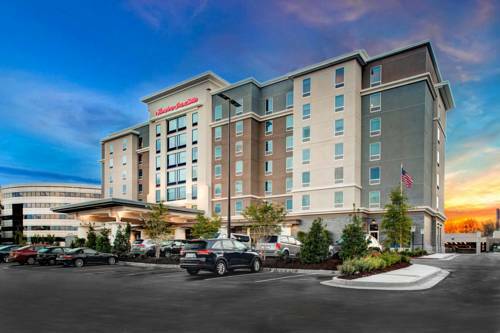 Enjoy modern comforts and an ideal location at the new Hampton Inn - Suites Atlanta Perimeter Dunwoody hotel. Walk to Perimeter Center Mall several restaurants Fortune 500 companies and the MARTA rail station. This stylish hotel near Dunwoody is just off I-285 only 20 minutes from downtown Atlanta. Reach Hartsfield-Jackson Atlanta International Airport /ATL/ in 30 minutes. Each sophisticated guest room features a mini-refrigerator microwave flat-screen LCD TV spacious work desk and a clean and fresh Hampton bed. Prop your laptop on the handy lap desk and use free WiFi. Enjoy the free weekday newspaper with coffee brewed in your room. Studio suites offer a sitting area with sofa sleeper great for extended stays. Join us each morning for Hampton*s free hot breakfast including fresh-baked waffles eggs muffins fruit and yogurt. Stop by our 24-hour Suite Shop for snacks and drinks and enjoy coffee and tea 24 hours a day in the lobby. Feel like dining out. Our Perimeter Center hotel shares a plaza with The Corner Bakery and a steakhouse. Unwind after a long day in the heated indoor pool or work out in the free fitness center. Host a meeting or family reunion in the 563 sq. ft. conference room with WiFi access. Our 24-hour business center has fax photo copying and free printing services as well as A/V equipment rental.